Summer is on the way! Well, at least that’s what the weather report says. So, get ready for the mini-UK heatwave with these tasty vegan and refined-sugar-free lollies. This supercharged lolly is delicious and rather beautiful! Full of berry goodness so that you can eat it for breakfast! 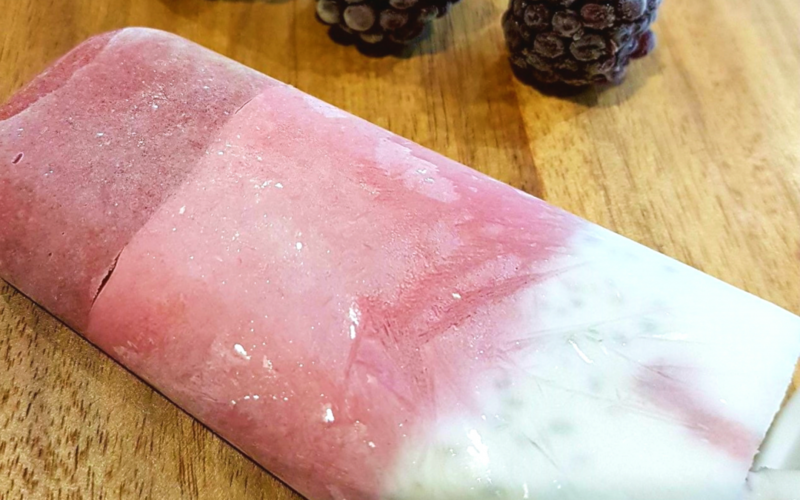 The sweetness of the berry powders combined with the fresh berries help to sweeten this lolly naturally so there is no need for much added sweetener at all. This is one of those sneaky recipes that really does not taste what you might call “healthy” – but totally is! I also love to add chia seeds in for the added fibre and Omega-3 oils. I think it also makes the lolly look even more exciting! Add ½ tbs chia seeds. ½-1 tsp Organic Berry Blend (I use a full teaspoon for an intense berry flavour and for added nutrition). 7 frozen / fresh raspberries. 4 frozen or fresh blackberries. Start by putting some of the purple mixture into the mould. Filling it approximately one third of the way. This will be the top of the lolly. Pop into the freezer to set (for about an hour or so). Repeat the above step with the pink layer. Then lastly the white layer.